I posted earlier about the first schoolhouse tunic I made using Sew Liberated's pattern. Due to the higher cost of this pattern I wanted to make sure I used it several times. I had decided to try to make it as a dress for a variation. 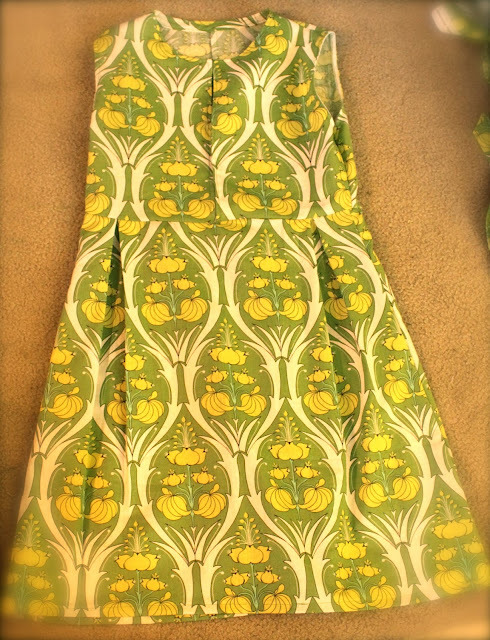 I really wanted to make myself a top out of this Amy Butler fabric I had been holding on to. I had to piece together this one because I didn't have enough fabric and the end result...a way too small dress. So, lucky for Betsy...she is a lot smaller than me and it fit her. Since I happened to be at her house while making it, I just tossed it over to her and tried to move on...which was hard, I loved that fabric! Here is a pic of the finished dress. The two alterations I made were leaving it sleeveless (adding bias tape facing instead) and cutting it longer to make a dress. Oh well, on to take 3. This time I used a lovely fabric I found at the thrift store. It was actually two curtain panels but I loved it and for $8.00 I was able to make a dress and a tunic out of all this fabric, with some left over! I would say it was a good deal. Again I added several inches to the bottom of the pattern, just continuing the slight a-line, to create a dress length. Overall, I like the finished dress but I think I will stick to the tunic length or shorter for future projects using the Schoolhouse Tunic pattern. this is gorgeous! love the fabric and how you did it! Also love the various skirts you made, really cool. thanks so much for visiting my blog and for your lovely comment on my lacy dress, got me to visit you. i love your blog, so much inspiration! you found that bottom fabric at a thrift store?! ha ha its an old Amy Butler print!!! love it!! looks so retro!